Zucchini cooked in various ways, one of them is the suppression. Steamed zucchini is good in the form of hot and cold appetizers, the main dishes and as a garnish. Recipes for stewing there is a huge number, try a few, diversify according to your taste and please your family with delicious dishes. Steamed zucchini, which is perfect as a side dish to meat and poultry, are prepared quite simply, their cooking will take only 20-25 minutes. Prepare all the ingredients. Wash the zucchini, if his skin is rough and thick, then peel the zucchini from her. 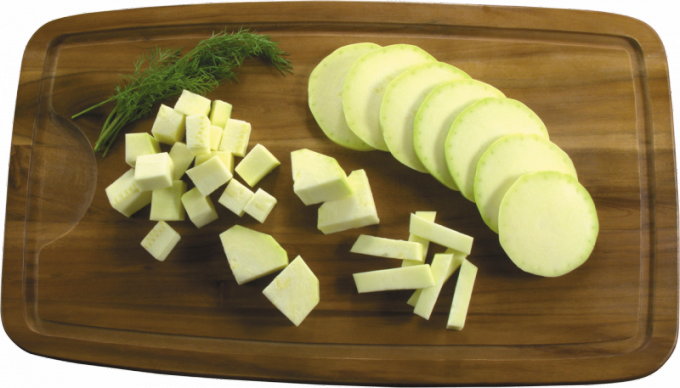 Zucchini cut into medium-sized cubes. Clean the onions and finely chop the onion. Scald with boiling water tomatoes, remove the skin and cut into small pieces. In a deep pan, place on high heat, add vegetable oil. Saute the onion until Golden and soft, then add the onions chopped tomatoes and fry to release the tomato juice for about 4-5 minutes. Add to the pan the zucchini, season with salt and pepper to taste, stir and leave to simmer under a closed lid. Braising zucchini will be done when they become soft and tender. The time depends on the size of the cubes of zucchini (every five minutes, stir the dish after about 15-20 minutes it will be ready). Braised zucchini with stuffing - fine, quite light and delicate dish. Prepare the food - wash and cut into large julienne the zucchini, peel and slice onion, peel and pass through a garlic press a couple of cloves of garlic. Heat a deep pan with vegetable oil, add the onion and saute a few minutes until Golden brown. Then add the minced meat to the onions, cook until soft 5-7 minutes. Add to the mince the zucchini, season with salt and pepper, add garlic and stir. Next you need to simmer the dish with the lid closed over low heat for 20-25 minutes. In case the stuffing and the zucchini allocated is not enough juice, add some hot water to the pan. Young squash are tender and juicy peel, don't get rid of it - it contains a lot of vitamins. Over time, the skin of zucchini coarsens and becomes bitter, so old it must be cut, and you can also remove the seeds.